Lewis Pulleys is a family owned and operated power transmission and internal keywaying specialist. Established on 29th July 1911, Lewis Pulleys began trading as a partnership between brothers Charles and James Lewis, known as Lewis Bros Mechanical & Automotive Engineers. On James Lewis’ passing in 1925, another brother, Andrew Lewis, joined the partnership and eventually became the sole proprietor. 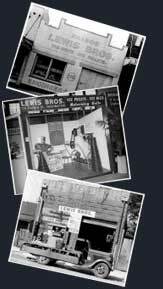 In 1962, the entire operation moved to the current address in Alexandria and Lewis Pulleys Pty Ltd was formed. To this day, Lewis Pulleys remains family owned and operated by the fourth generation. In May 2007, Lewis Pulleys became the Australian agent for the Vald Birn Ventilated Turbo Pulley (VTP). This achievement was earmarked by a VTP product launch function held with Mr Henrik Telling (Chief Engineer) and Mr Mogens Bach (Finance Officer), both Vald Birn A/S representatives from Denmark and over 90 clients from a broad spectrum of business such as Air-conditioning, Mining and Pumping. In April 2008, Lewis Pulleys expanded operations and now markets the VTP, under agreement, throughout the Asia-Pacific. Regional areas through the new agreement now cover New Zealand, New Guinea, Fiji, New Caledonia and the Solomon Islands. Lewis Pulleys has a fully equipped workshop for all machining needs with a vast range of stock available off the shelf. A convenient delivery service to the Sydney CBD and North Sydney operates seven times a day which equates to great time and cost savings to those needing parts on-the-go. Offering over the phone diagnoses, the professional sales team can design all types of drives for your needs. With over a 100-year track record, you can trust Lewis Pulleys to take care of all your power transmission requirements.